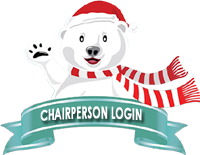 We provide everything you need to publicize and run your Holiday Treasures Gift Shop. All of these supplies and resources are included free with your shop. A Gift List Planner is given each student in your school to help them plan who they want to buy for in your shop. Students are encouraged to fill this out with their parents prior to shopping. A library of promotional fliers and letters are available online for you to customize and use in your shop’s promotion. Four large posters are provided for display in your school. You customize these with the day and time of your shop. 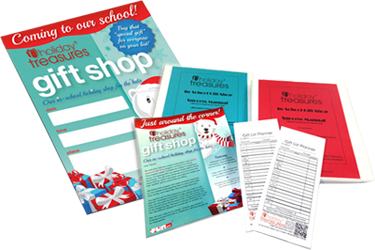 Colorful 8 ½ x 11 inch fliers are sent home with each student to announce the Holiday Treasures Gift Shop is coming to your school. A bilingual version is available, too. A Wish List with the items for sale in your Shop is available for each student. Use these in a “preview day” or to send home with the Gift Planner Envelope. Each Wish List contains a link to your shop's online Gift Preview Site. Decorative mylar gift bags in four sizes are provided free for gift wrapping in your shop. White plastic shopping bags are provided free for children to carry all their purchases back to the classroom or home. Colorful tablecloths are provided to decorate your gift display tables, along with self-adhesive display price labels pre-printed with your gift prices.